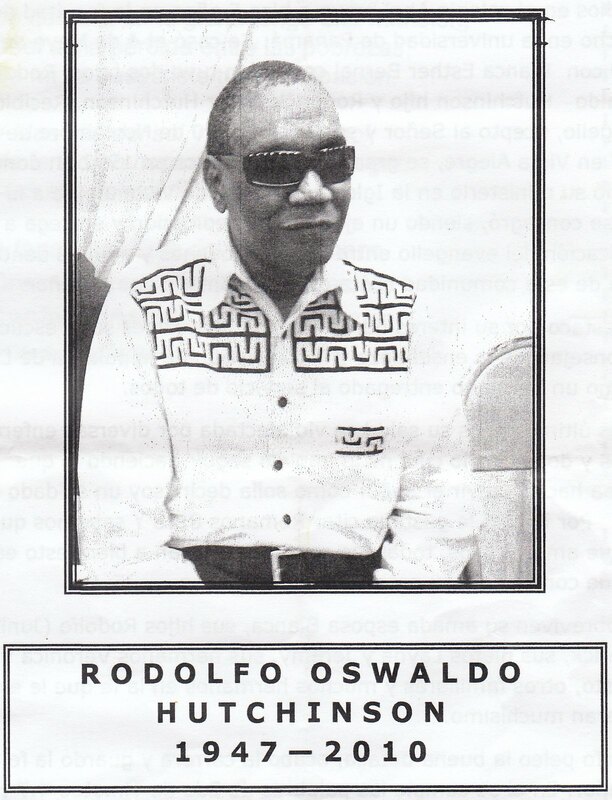 Rodolfo Oswaldo Hutchinson was born second son to Rodolfo Oswaldo Hutchinson and Elsa Green on September 21, 1947 in the City of Colon, Panama. He completed his secondary studies at Colegio Abel Bravo in Colon, Panama and completed his course of studies in the Law School of the University of Panama. On May 4 1979 he was married to Blanca Esther Bernal with whom he had two sons, Rodolfo Oswaldo Hutchinson, Jr. and Roderick Oscar Hutchinson. He accepted the Lord, Jesus Christ, on November 10 1987 in Vista Alegre, Arraijan, Republic of Panama. He went on to study for a pastoral career and in 1992 graduated as Pastor and devoted himself to his ministry at the Church of Christ of Vista Alegre. Ever since he has become an example of dedication and commitment to preaching the word of God to many adults and adolescents inside and out of the community until he was called to be with the Lord. He went to be with the Lord on 15 April 2010 having left behind a much better world and a church and community full of faithful followers of the Gospel of the Lord Jesus Christ. Many have been the families that he has reunited, the children that he has reconciled with their families and to their society, and many have been the individuals who will always remember him for his tireless prayers. He never refused a request for prayer and remained ever available to those who earnestly sought his help. Rodolfo nació el segundo hijo en el matrimonio conformado por Rodolfo Oswaldo Hutchinson y Elsa Green, el 21 de septiembre de 1947 en la ciudad de Colón, Panamá. Completó sus estudios secundarios en Colegio Abel Bravo en Colón, Panamá y logró finalizar su curso de estudios en la Facultad de Derecho de la Universidad de Panamá. El 4 de mayo de 1979 se casó con Blanca Esther Bernal, con quien tuvo dos hijos, Rodolfo Oswaldo Hutchinson, Jr. y Roderick Oscar Hutchinson. Aceptó el Señor, Jesucristo, el 10 de noviembre de 1987 en Vista Alegre, Arraiján, República de Panamá. Emprendió sus estudios ministeriales y en 1992 se graduó como pastor dedicándose a su amplio Ministerio en la Iglesia de Cristo de Vista Alegre. Desde entonces se convierte en un ejemplo de dedicación y compromiso para predicar la palabra de Dios a muchos adultos y adolescentes dentro y fuera de la comunidad, hasta que fue llamado por el Señor. Pasó a estar con el Señor el 15 de abril de 2010 dejando un bello legado de un mundo mejorado por su infatigable presencia y una iglesia y comunidad llena de fieles seguidores del Evangelio del Señor Jesucristo. Muchas han sido las familias que reconciliadas y niños que él ha restituidos con sus familias y a su sociedad gracias a su ministerio. Aun muchos más han sido los individuos que siempre recordarán sus oraciones incansables. El Reverendo Rodolfo Hutchinson nunca rechazó una petición de oración permaneciendo siempre disponible para quienes sinceramente buscaban su ayuda. I met Rodolfo Hutchingson at the Colon Center for the Blind in Colon, Republic of Panama many years ago. It has been sad to know about his death this late. I remember him as a very intelligent and happy human being. My best wishes to his widow and children. We have also prepared a Find a Grave memorial here. Please visit it and leave a virtual offering and a note for him (free of charge).